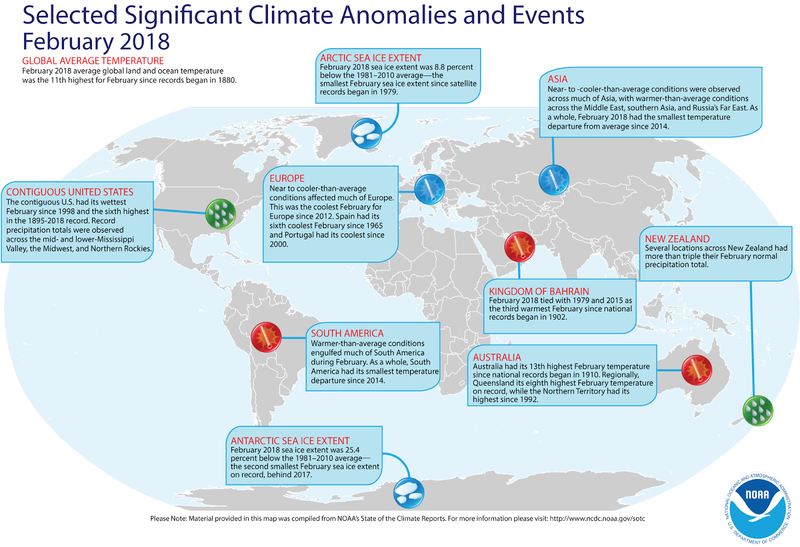 An annotated map of the globe showing other notable climate events that occurred during February and Winter 2018. (NOAA NCEI) Click on image to enlarge. Today is the first day of Spring in the northern hemisphere but you wouldn't think so if you live in Europe or the Northeast of the US with Siberian cold and heavy snow respectively so late in the season. Our planet recorded its coolest February since 2014! Though La Nina is starting to wane, the ocean-cooling phenomenon continues to lower global temperatures. February 2018 ended up being Earth’s coolest February in four years. The December-to-February seasonal period also was the coldest it has been since 2014, according to scientists from NOAA’s National Centers for Environmental Information. The average global temperature in February 2018 was 1.17 degrees F above the 20th-century average of 53.9 degrees. This was the 11th highest for February in the 139-year record (1880-2018). February 2018 was the 42nd consecutive February and the 398th consecutive month with temperatures above the 20th-century average. The end of February marked the end of the meteorological winter for the Northern Hemisphere and summer for the Southern Hemisphere. 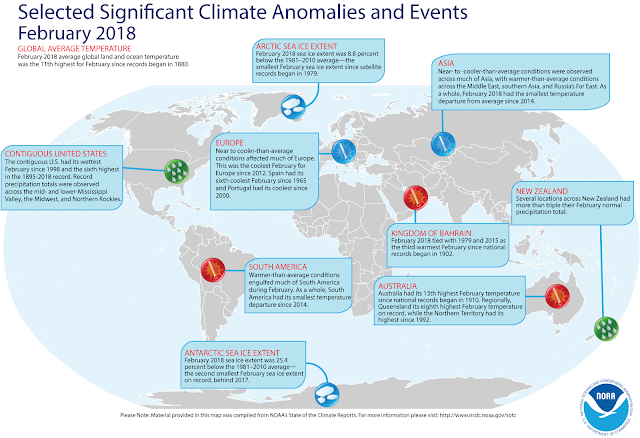 The average seasonal temperature for the globe was 1.31 degrees F above the 20th-century average of 53.8 degrees, and it was the fifth warmest for December-February in the record. The year-to-date average global temperature was 1.22 degrees F above the 20th-century average of 53.8 degrees. This was the eighth-highest temperature for the year to date period on record and the coolest such period since 2014. The average Arctic sea ice coverage in February was 8.8 percent below the 1981-2010 average, the smallest February extent since records began in 1979. Antarctic sea ice coverage in February was 25.4 percent below average, the second smallest on record. On February 20 and 21, Antarctic sea ice reached its annual minimum extent at 842,000 square miles, the second lowest minimum coverage on record. The globally averaged land-surface temperature ranked 15th warmest for the month of February, seventh warmest for the season (December to February) and 11th warmest for the year to date (January to February). The globally averaged sea-surface temperature ranked seventh warmest for February, and sixth warmest for the season and year to date. Oceania had its fourth warmest February on record; Africa, its 10th; South America, its 13th; Asia, its 26th; North America, its 59th; and Europe, its 63rd. For the season, Oceania had its warmest December-February (season) on record; South America, its 11th; Europe, its 11th (tied with 1989); Africa and Asia, their 12th; and North America, its 25th (tied with 1941). More chemically induced cool downs. Stop regurgitating the false narrative and do some research. Geoengineering must be stopped if we are to live on this planet much longer. Help spread the truth! Agree with you Jae, are we suppose to believe this lie from a noaa? So not funny the false news reports on all levels from all government agencies. Its really to late to turn anything around, ignorant, easly controled people as a whole will lead us to doom. Kaos is coming, so sad. On a good note, the Facebook truths are coming to light, Snowden's resent statement that its a front for the government dogs of death.